It’s one of those nights when I don’t have anything worth writing. Whatever follows is guaranteed, certified piffle. I did read another book, but it’s one in a series I’ve been following and reviewing for a while. You already know what I have to say about these books. 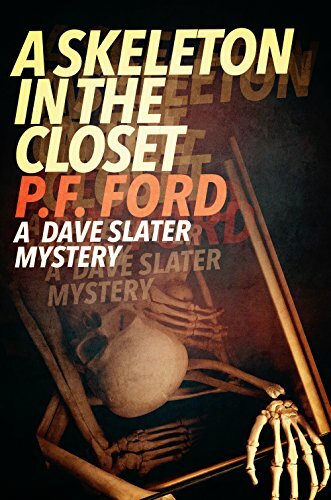 A Skeleton in the Closet is the seventh in P. F. Ford’s Dave Slater series, about a small town detective in England. What can I say? Like the others, it’s lightweight but likeable. I estimate the Dave Slater books at about the intellectual level of a TV series – an American TV series. Which means they’re entertaining, but they won’t change your life. In this one, a colleague dies in an explosion, and Dave must delve into this person’s personal life, which turns out to have been full of secrets. At the same time, he’s under pressure from what in America we’d call Internal Affairs. In all contemporary fiction series, there’s a moment or two – or several – when certain cultural boxes must be ticked, in order to satisfy the commissars. This is a story where author Ford ticks off one of them. Upbeat and cheerful, good entertainment even with the social freight. God bless instructors who assign books we already have plenty of. On the writing front, I’ve found my way at last after a long stretch wandering without a map. I feel keenly the fact that a few faithful readers have been waiting patiently for this book for years. All I can say is, I’m bringing it as fast as I can. The last comment is news to smile about. Good to hear that.